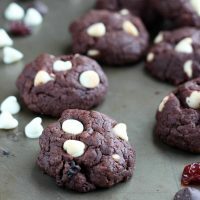 Double chocolate chip cookies with white chocolate chips and dried cherries are proof that you can improve upon the every day chocolate chip cookie. This cookie is good any time of year but I especially like it as an easy holiday cookie exchange recipe. This recipe will be made again in February for Valentine’s Day in my kitchen. Double chocolate chip cookies with dried cherries are a dressed up version of my favorite brownie cookie recipe. The additions are simple– white chocolate chips and dried cherries– and it makes this an entirely different cookie. I like the play of the sweet dried cherries with the bits of white chocolate. During the summer I bake these dried berry cookies with white chocolate chips— red, white and blue theme– and along the same lines as a dressed up chocolate chip cookie. 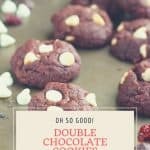 What ingredients are in double chocolate chip cookies with dried berries? I originally made these double chocolate chip cookies with dried cherries with an online cookie-loving group, the #CreativeCookieExchange. Our theme was chocolate with berries so you can see how well the double chocolate cookies with dried cherries fit into those guidelines. Do you want to switch it up a bit more? Add nuts if you wish, a bit of salty crunch would be a nice addition here. Are you making these double chocolate chip cookies with dried cherries and sending them in the mail? This is how I package cookies for the best success in getting your goodies to their destination in one piece. Do you need an easy recipe for a Christmas cookie exchange? Here is a list of my favorites. Or is a chocolate cake with chocolate ganache calling your name? Chocolate peppermint crinkle cookies are festive and holiday-party ready. Preheat the oven to 350 degrees F. Prepare baking sheets with parchment paper. In one bowl add the flour,baking powder, and cocoa powder. Whisk gently then set aside. In the bowl of a stand mixer beat the butter, white sugar and brown sugar. Add the vanilla and the eggs, continue to blend on medium high speed. Lower the speed to medium low and incorporate the melted chocolate into the mixture. Using a spoon, fold in the flour mixture to the wet ingredients. Add in the dried cherries and the white chocolate chips. Fold until just barely incorporated. Chill the cookie dough in the refrigerator for 30 minutes. Remove the cooled cookie dough and make tablespoon sized balls of dough. Place on the baking sheets. Bake for 11-13 minutes. Let cool on a wire cooling rack. Are you on Pinterest? I am! 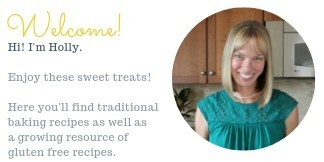 Join me there and save this pin to your cookie boards. Do you love baking (and eating) cookies as much as we do? If so, we’d love for you to join this baking group. Just contact Laura at [email protected] and she will get you added to our Facebook group where we discuss our cookies and share links. 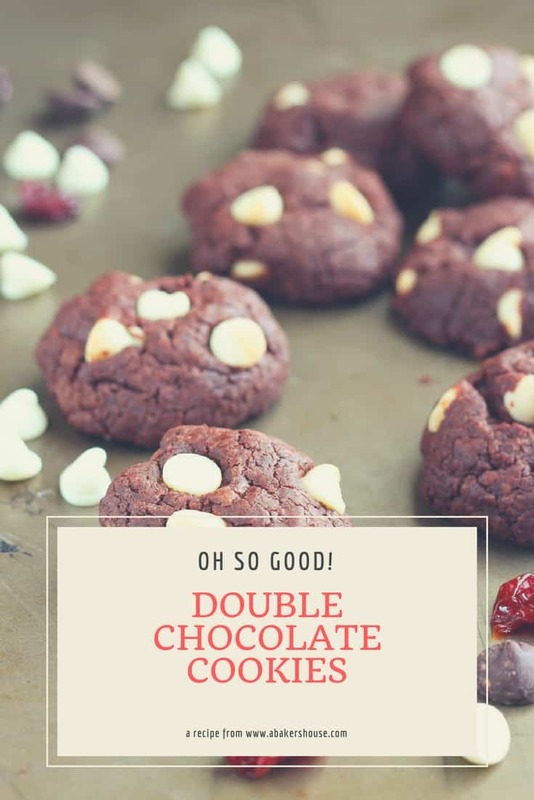 You can also just use us as a great resource for cookie recipes–be sure to check out our Facebook page, our Pinterest Board, and our monthly posts. You will be able to find them the first Tuesday after the 15th of each month! 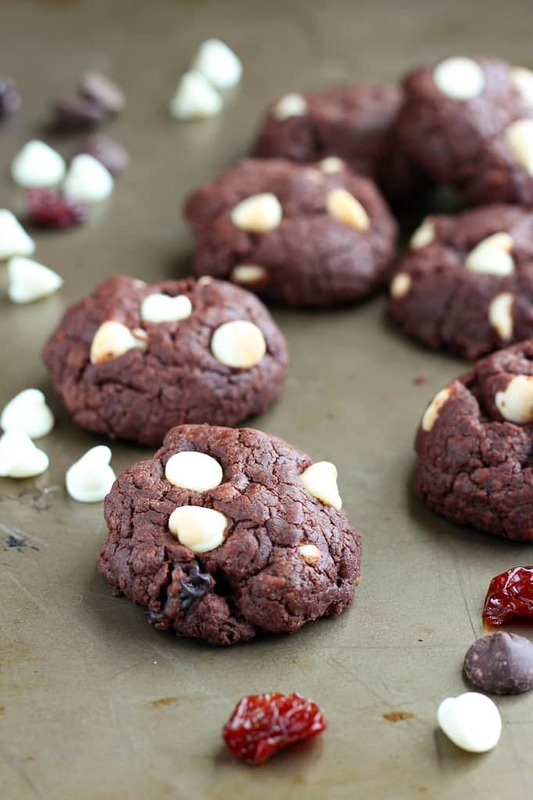 I love combining chocolate and cherry; these cookies would be a hit here. You are right, you can’t go wrong with these flavors! Chocolate and cherries in my all time favorite, followed by chocolate with orange! Delicious looking cookies! I had a great chocolate bar from the Boulder based Chocolove recently and loved the orange and chocolate combo. Making that flavor pairing in a cookie would be divine. These look like perfect cookies in my book! Wonderful! What a grand way to combine chocolates – bittersweet and white. Love it! You are so kind, thanks for your encouraging words. Your cookies look and sound so good. I saw your post earlier today Abbe, and am STILL thinking about that tart you made. Oh my goodness it looked good. Such a cool cookies! I love the roundedness of them! And I love bittersweet chips! Oh wow what a combination of flavors! I want to bake one but before that I would like to have one! 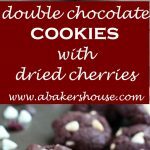 Chocolate and cherries remind me of my favorite candy bar, so I am looking forward to grabbing some dried cherries to try this recipe. Yum! Just realized that I need more cookies in my diet. Yum! So pretty!